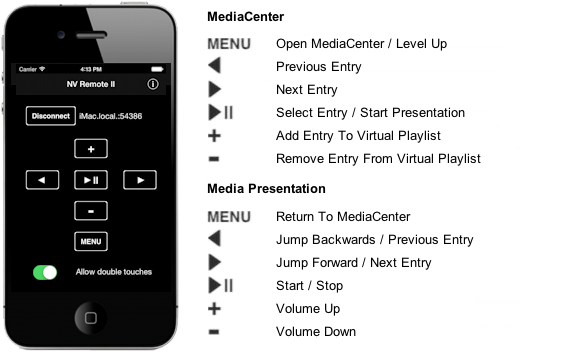 Download "NV Remote II" app on your iPad, iPhone or iPod touch and remote control nessViewer in the same way as with the Apple remote control. Connect "NV Remote II" within your local WLAN with nessViewer and remote control the media center, media presentations and other media windows (like DVD playback, movies, media shows etc.). For example the iTunes control of the media center can be used to change the current playlist or track on the Mac while you are sitting in another room. In landscape mode the view shows the current selection of the media center - e.g. the current playlist or track of iTunes. 3 different touch modes are supported: normal, double or hold. Please read the help of nessViewer to see a list of supported remote commands for the active media content. Current version 1.2 available in the App Store since July 25, 2018 - more informations at news. and test it with the nessViewer demo version. Copyright © 2010 FINESS Software UG - All rights reserved. Apple, Macintosh, iTunes, iPhone, iPod are trademarks of Apple Inc., registered in the USA and other countries. All the other trademarks are property of the respective entitled persons.